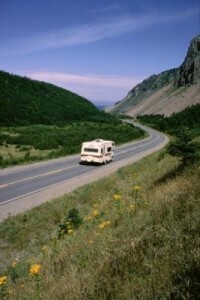 Exploring Nova Scotia by RV or Motorhome is a popular way to see the province. You can bring your own or rent one from companies like Canadream and Cruise Canada (both have offices in the Halifax area) for about $150-200 a day. Book well in advance for peak season travel. Once on the road, you’ll find all but the smallest rural roads are accessible, although maintenance standards vary and harsh winters can leave potholes in the road surface. Be prepared for a potentially bumpy ride anytime you leave the Trans-Canada Highway. Some of the road grades in Cape Breton, around the Cabot Trail, could also prove challenging for larger RVs. There are long stretches with a 10% grade and some as high as 15%. Campgrounds are widespread, with costs starting around $25 a night, and tourist attractions have plenty of parking for large vehicles. If you plan to take a ferry from New England, New Brunswick or Prince Edward Island, make sure you reserve a space since there are limited spots for motorhomes. One bone of contention with RVers is Nova Scotia’s law prohibiting campers from stopping overnight anywhere but in a licensed campground. How often the law is enforced is debatable but in theory it means no camping in the parking lot at Wal-Mart or the local hospital. Even if the landowner doesn’t mind or the nearest campground is full or closed for the season, it’s still illegal. Needless to say, many people – Nova Scotians and potential visitors – don’t like this law and many write emails and letters of protest to the Department of Tourism.